But What is Legal Isn't Necessarily Right! Apartheid was legal but it wasn't morally right. Slavery was legal but it wasn't morally right. Slavery in centuries past and abortions in this century were defended and promoted by the same arguments. Consider a case in the USA: In 1857, the US Supreme Court decided, that according to the US Constitution: "black people were not legal persons. They were the property of the owner. He could buy, or sell, or even kill them." Those who supported slavery argued that no one was forcing those who had moral objection to slavery, to own slaves. But they said: "Don't force your morality on the slave owner. He has the right to choose to own slaves if he wishes." Just over one hundred years later, in 1973, the US Supreme Court decided that unborn people were not legal persons. They had no civil rights, no human rights and were therefore, legally the property of the owner (the mother). She had the absolute legal right to keep or to destroy her unborn baby. The pro-abortionists say: "No one is forcing you to have an abortion. But don't force your morality on the mother. She has a right to choose to kill her developing baby if she wishes." "No one has the right to do what is wrong." It's My Body. I Can Do With It As I Choose! Once conception has occurred, you no longer have a choice - you have a child! Once the baby is born, you are again free to choose - you can keep the child or lovingly place him or her by adoption. The option that pro-lifers oppose is that of murder. After conception, you are responsible for the life of your child. The choices you make will determine whether your child lives - or dies. All our rights are limited when they infringe on the rights of others. The key question is: 'Will I cause harm to someone else?" With abortion - obviously the answer is "Yes!" because abortion kills another person. The pre-born baby is a person from the time of conception: Time Magazine and Rand McNally's Atlas of the Body states, "In fusing together, the male and female gametes produce a fertilised single cell, the zygote, which is the start of a new individual." That first cell contains the entire genetic blueprint with all its detail. • The baby's heart starts beating inside the womb three weeks after conception. • Electrical brainwaves have been recorded at six weeks on an EEG. If the absence of a brainwave indicates death, why won't pro- abortionists accept that the presence of a brainwave is a confirmation of life? • At the end of nine weeks, the baby has his own unique finger prints. • By 12 weeks, the baby is sensitive to heat, touch, light and noise. All body systems are working. He weighs 28g and is 6 to 7.5 cm long. From conception, the new person conceived is as deserving of protection by the law as any other person. 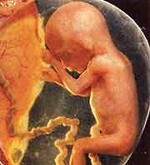 • From 12-20 weeks, the conditions are so broad that almost any woman could have an abortion for any reason whatsoever! • Young teenagers are able to kill their babies' even without their parent's consent! The parents do not even need to be informed after the fact! • Wives are able to kill their husbands' baby without his consent or knowledge! • A doctor is not penalised if he acts outside the terms of the law, however, a person trying to save babies' lives may face a prison sentence! By making the murder of pre-born babies legal, easy and taxpayer funded, this "law" defies all logic. Everyone has been endowed by the Creator with the right to enjoy and defend life and liberty. Please contact a Crisis Pregnancy Centre, where they will surround you with practical and emotional love and support. They will help you in explaining to your boyfriend, husband or parents and help you choose the right decision for you and your baby. They will also give you practical help and advice throughout your pregnancy. Their help is confidential, free and is given regardless of your marital status, age or religion. · Be Interceding: For mothers in crisis pregnancies, for the babies soon to be aborted; for crisis pregnancy centres and pro-life ministries; and that God would have mercy on our land and close down the abortion clinics, and remove this "service" from government clinics and hospitals (James 5:16). · Be Informed:: Study the Bible to see what it says on the sanctity of human life, murder, and God's commands to take a stand against unrighteousness. Contact Africa Christian Action and ask for free copies of "Milestones of Early Life", "The blood of the innocent - on our hands?" and "Show You Care." Order "Make a Difference, A Christian Action Handbook for Southern Africa" (at R58 per book) and The Fight For Life Audio CD (R20) for the Biblical, medical and social facts surrounding abortion and what you can do to make a difference. Crisis Pregnancy Outreach Poster now available! See Pro-life Resources for more details.